Maybe it is because it is so hard for them to do it, women hardly ever fake it. After all, they paid such a higher price for service than males do. Is it that these events are not being reported? Is no one trying to track them down? Or, is it more about the fact that women performing next to men is never worthy of the press covering? Oh, wait. Did you think this was about faking a great sexual experience? Well, shame on you for being mislead like that. This is about Stolen Valor and females faking their military service. Since it has been happening, but under the radar, I thought it was a good time to bring it up. There are a lot of reports on males faking it. In May there was John Hemphill "He claimed to have served our country for 22 years until a FOX6 investigation exposed him as a liar." There are a lot of things folks just assume. If a male veteran says they have PTSD, it is assumed they have it because of combat. If a female veteran says they have PTSD, well it is assumed it is because of some kind of sexual trauma. Why is that? Is it because people forget that women are in the field just like their "brothers" are? Well, their "brothers" get assaulted too but females are just talked about more. It seems as if everything involving women in the military is less talked about than males in the military. This morning I was thinking about a Stolen Valor article I read and then I tried to remember reading about many women being accused of faking service. So, not being able to just let it go and enjoy my vacation from work, I did a search. We were sent an article from the Coeur d’Alene, Idaho Press paper from November 10th 2013. 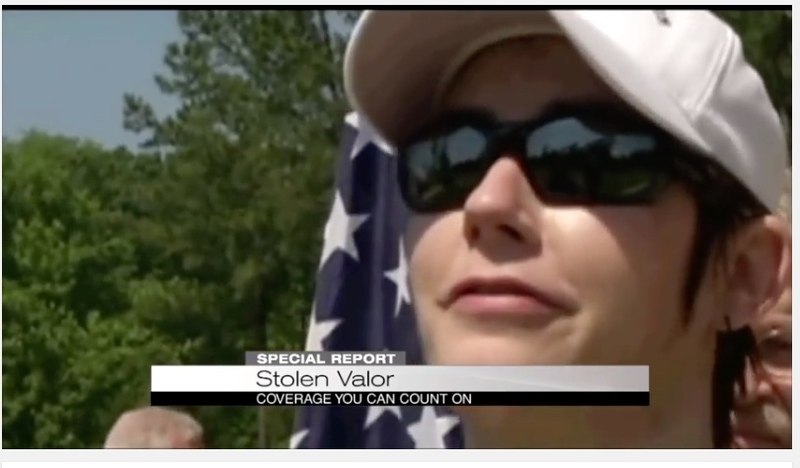 In this article they interviewed what they believed to be an Iraqi War Veteran, and Wounded Warrior, Christina “Chrissy” Axtman. As I began to read the story, red flags started flying. 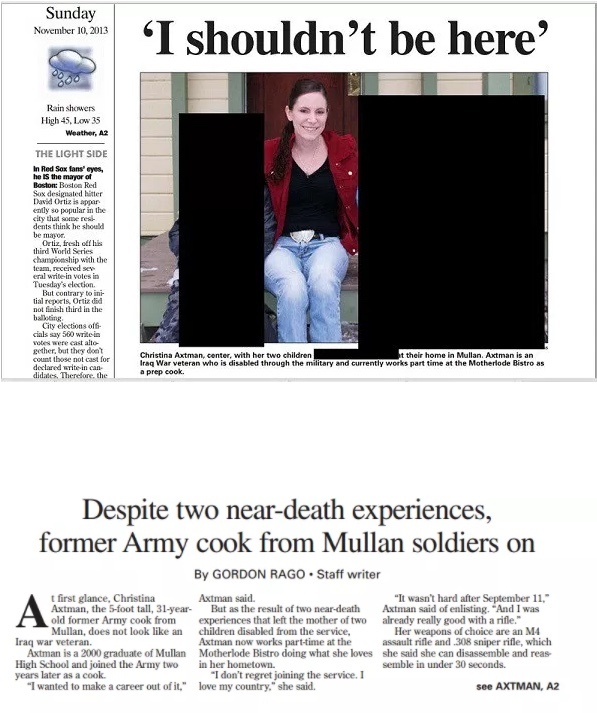 The person that emailed me said that Christina was telling everyone her story, and how she had earned the Bronze Star for Valor while deployed with the 173rd Airborne to Iraq in 2007. Notice the paper calls it a Division not a Brigade, although they operate as a Division they are not. I am not sure if this was her statement or just a mistake by the editor. Not only that, but according to the 173rd’s Deployment history, in 2006 the Brigade was notified for a second tour of duty in Iraq from 2007 to 2008, but its deployment plan was changed to Afghanistan in February 2007 when the Pentagon announced that it would relieve the 3rd Brigade Combat Team, 10th Mountain Division along with the 4th Brigade Combat Team, 82nd Airborne Division. In the spring of 2007, the 173rd again deployed to Afghanistan, as Task Force Bayonet, in support of Operation Enduring Freedom (OEF 07–09). So the 173rd was not even in Iraq for the time frame she claims she was with them. Yet, it wasn't 16 years of service but it was 16 days! We've seen videos of Stolen Valor before — people impersonating someone who they are not while in a military uniform. Parrish Alleman of CBS-affiliate WIAT 42 in Birmingham, Alabama, launched a five-month investigation after receiving tips that a military member she had interviewed was a fake. It turns out after a lot of investigative reporting that Julee Johns had only served 16 days — not the 16 years she initially claimed. Pretty much you must have guessed there are very few women pretending to be something they are not. After all, women can't claim to be Navy SEALs or Green Berets easily. While women have been recipients of every military award, including the Medal of Honor, they are not usually thought of as heroic. Medal of Honor? Yep, knew I'd get you on that one. There was a Doctor during the Civil War and she was also a POW. Dr. Mary Edwards Walker not only received the Medal of Honor, she refused to give it back with Congress tried to take it from her. So when do we stop taking honor from other women and stop assuming stuff that just isn't true or connecting stuff to their sexuality instead of their courage?